AGAR 23 Memorial Association, LLC, is excited to announce that the newly completed AGAR 23 Memorial in Walkersville, Maryland, will be dedicated on Sunday, May 6th, 2018. 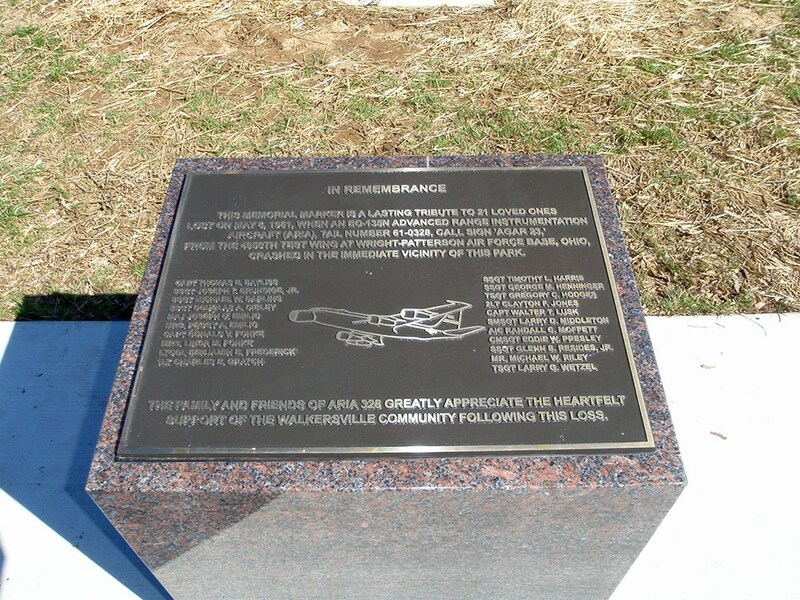 The monument was built to honor the lives of the twenty-one souls lost aboard the US Air Force Advanced Range Instrumentation Aircraft (ARIA), tail number 6 1-0328, call sign AGAR 23, which crashed near Walkersville, Maryland, on May 6, 1981. The dedication ceremony will be held at Heritage Farm Park, 9238 Devilbiss Bridge Road, Walkersville, MD. It will begin at 10:00 A.M. The 10:00 A.M. Sunday morning start time was selected so that the dedication ceremony will coincide with the exact time, to the hour, that AGAR 23 crashed 37 years ago in the fields near ,vhat is no,v Heritage Farm Park. The AGAR 23 Memorial dedication ceremony is open to the public, and all are invited to attend. For more information, please visit the AGAR 23 Memorial Association website https://agar23memorial.com/. In addition to the dedication ceremony, the AGAR 23 Memorial Association will host a memorial dinner on Saturday, May 5, 2018, 6:00 P.M. at the Walkersville Volunteer Fire Company. “We are calling this event “The Gathering,” said Mr. Bob Beach, AGAR 23 Memorial Team Chair, “because it’s a time for the families, first responders, residents, and former ARLA. members, to come together to share their experiences, all while honoring the 21 men and women lost 37 years ago.” All area residents are sincerely invited to attend. The cost is $15.00 per person and advanced registration is required. Seating is limited. The registration form and mailing address is located on the association’s website https://agar23memorial.com/.